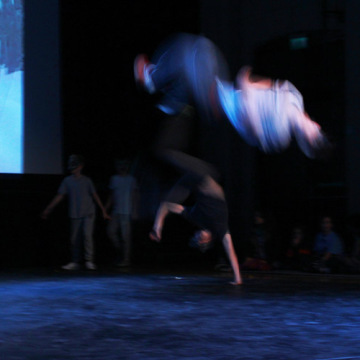 The Leg-it Boys project got off to a flying start as the two groups from Weydon & Christ’s College Guildford joined forces to perform as part of The Dance Movement’s annual Winter Move show at Farnham Maltings. The Dance Movement has been busy with a new project, Leg-it; a specialist year long boys only performance programme. Two clubs were set-up in partnership with secondary schools, Weydon and Christ’s College as a result of funding from Active Surrey’s Satellite Initiative. The boys worked with dance artists from the Company Rachel Palmer and Jack Philp to create a number of dances for the annual community performance, Winter Move, which was based upon The Lion, The Witch and The Wardrobe; the boys played the part of the white witche’s wolves and wowed audiences with their acrobatic choreography. 17 boys aged between 10 – 16 years took part in the first term of the project. Each group worked independently for 10 weeks and then came together for two rehearsals to intertwine their choreography. Leg-it starts up again in January, with the Christ’s College group coming to Weydon school for the first three works of the term to create a brand new performance, based on the idea of ‘escaping’.